In 1892 a former U. S. Cavalry officer from St. Louis arrived in Duluth and promptly proceeded to pick out a lot on the lower 300 block of West Superior Street, hire Duluth’s premier architects, and build the Zenith City’s first “skyscraper,” a brick-and-terra cotta masterpiece that stood ten stories above Superior Street and rose eleven above Michigan Street. This dependable building has continuously served Duluth for 122 years, and for about 30 years Duluthians literally set their watches by it. That cavalry officer, Captain Robert Augustus Torrey, was born in 1839 in Pittsfield, Illinois, and grew up in Louisiana and Missouri. During the Civil War he fought with the 13th Illinois Infantry and by January 1862 had achieved the rank of second lieutenant. He survived the war—as did his brother, Colonel Jay L. Torrey—and afterward remained in the military, joining the U.S. Cavalry as a captain. Torrey was sent to Wyoming while his brother began a law practice. Captain Torrey was placed in charge of Camp Brown. In 1878 the camp was renamed Fort Washakie, and that year Torrey resigned his post. He had convinced his brother to come to Wyoming and try their hands at ranching and real estate. In Thermopolis, Wyoming, they managed a large cattle and cavalry horse ranch, supplying the cavalry with horses. Jay also became involved in Wyoming politics. The brothers returned to Missouri, settling in St. Louis some time in the 1880s. Jay made a name for himself by revising a bill for a federal bankruptcy law in the late 1880s. While the bill passed the House in 1890, it couldn’t get through the Senate. Jay Torrey spent until 1897 trying to push it through, and a revised (and renamed) version of the bill passed that year. Colonel Torrey is also credited with coming up with the idea for the “Rough Riders,” cavalry volunteers who fought in the Spanish American War. Like Teddy Roosevelt, Colonel Torrey was placed in charge of his own regiment, but it never saw action. A train derailment cost the life of one volunteer and crushed Torrey’s feet. Meanwhile, the Colonel’s older brother had been expanding his real estate interests. It isn’t clear what brought him to Duluth in 1892, or even if his stay at the Spalding Hotel in May of that year was his first visit to the Zenith City, but he was soon ensconced in Duluth Society. By 1893 he had not only joined the Kitchi Gammi Club, but was living at its headquarters in the Glencoe Building. Moreover, his building was complete. Construction had begun in late 1892 under the direction of contractor James McMillen, but not without a delay. In December the steamer Northerner sank in Lake Michigan with structural steel for the Torrey Building and Jefferson Elementary onboard. In January, iron worker Frank Smith of Chicago fell off that structural steel; the eight-story drop killed him. 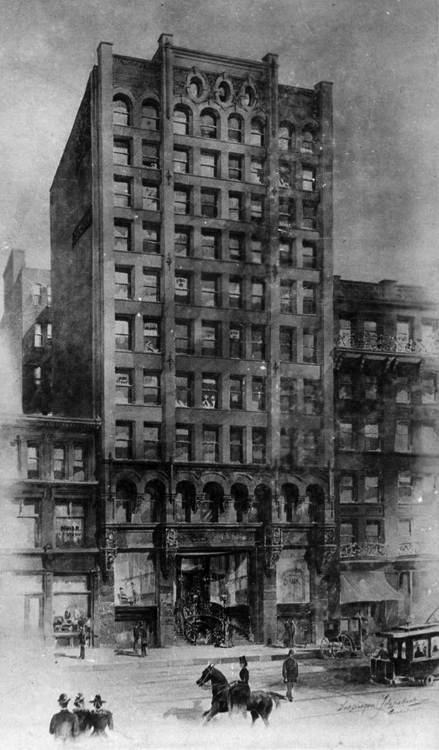 The eleven-story structure was faced with pressed brick and trimmed in brownstone from Port Entry, Michigan. The same brownstone was used in the building’s two-story, three-bay Superior Street façade, which Duluth’s master stone carver George Thrana adorned with lion’s heads, swags, floral designs, arched windows, and the words “Torrey Building” above a grand entrance that contained a central stairway. The Superior Street façade was very much in keeping with what Duluthians had come to expect from the building’s architect, Oliver Traphagen—heavy, Richardsonian Romanesque architecture with plenty of ornamentation. But floors three through nine were decidedly different, and perhaps show the influence of Traphagen’s business partner, Francis Fitzpatrick. Except for a continuous red sandstone sill, those upper floors were faced entirely with brick and free from decorative elements; all the windows are rectangular. At floor ten the Romanesque look returns to tie the two stylistic approaches together. On the tenth floor the windows are arched, and three ocular windows are set above the central bay; it is topped with a low decorative parapet capped with bronze coping. When all was said and done, Torrey had spent $300,000 for his office tower—about $7.8 million today. Despite its grand height, the most innovative aspect of the Torrey was its fireproofing system. The Torrey was one of the first buildings in the U.S. to use cutting-edge fireproofing techniques, such as using a steel structural skeleton and covering wooden beams with terra cotta. The fireproofing alone cost $30,000 (about $780,000 today), but it also gave Captain Torrey a marketing advantage during a time when Duluth buildings were burning to the ground, in part because the city’s water system didn’t supply sufficient pressure. The Torrey was soon filled with tenants involved with white-collar concerns: loan brokerages, law offices, a district court judge, the Graham School of Shorthand, etc. Traphagen & Fitzpatrick also set up office inside the Torrey. Fitzpatrick would be recognized as a pioneer of fireproof construction—why not set up shop in a building that exemplifies your finest, latest work?